Freedom is the right to think, speak and act the way that we want. I think I speak for a lot of us here today in saying that we no longer believe in the imposed concept of a government taking care of us from cradle to grave. I love the principles on which this country was founded. But a lot has changed since. Authoritarian tyrants have kidnapped free society. But make no mistake, people across the globe are waking up. The tyrants are losing. We can see clearly that the tide has turned. Political correctness is crumbling. We had Brexit in the UK a couple of weeks ago. The end of the world according to mainstream media. We have the rise of Donald Trump here in the US. Love him or hate him but he’s breaking political correctness. He’s saying the unsayable. It is starting to dawn on the tyrants that it’s all over. More speech is always better than less speech. So people are rising up, finally, people are rising up. Liberty is prevailing! Liberty will always prevail. Freedom is a powerful concept. Freedom to think, say, read and do what you want. We don’t need to be instructed how to live our lives. We have been oppressed by the government and lied to by the media long enough. Freedom is a force that can’t be stopped. We don’t need anyone’s authority to govern our own lives. Freedom, think about it, is simply the concept of living your life the way you desire. My name is Torgny. I’m an economist by training. I’m the founder of 3 different precious metals dealers worldwide. Being Swedish by origin, I first started the Swedish bullion dealer LibertySilver.se in 2008. Liberty because if you own precious metals, you can gain independence and liberty from the oppressive financial system as you’re not locked in to the fraudulent banking system. I have a Master’s Degree in Economics. If you ever get the chance to study economics, don’t do it. Economics is upside down. Instead of modelling what is actually happening in the real world, economics is a product of professors peer reviewing each other, holding each other’s hands, coming up with obscure models that they try to push onto the world. I subsequently started Liberty Silver in Estonia in 2011, and most importantly BullionStar in Singapore in 2012. Today I’m looking to cover three different topics. First, I will cover what is happening on the gold market by looking at the most important gold trends of 2016. What’s happening in the gold market and what can we expect ahead? Then I will talk about Singapore because Singapore is the very best place in the world for wealth preservation and asset protection and it’s the best place in the world to buy and store precious metals. And I will conclude by talking about how I have set up BullionStar with the purpose of servicing offshore bullion protection. I moved to Singapore with my family 3 years ago to establish BullionStar in Singapore simply because it is the best country in the world from which to offer precious metals services for international diversification, and asset and wealth protection. To understand the gold market, we have to understand what is happening in the global economy – and the relative ‘health’ of the global economy today. Stock and bond markets have been performing well over the last years but the underlying economies are struggling. Record low interest rates, sub-zero in many countries, and massive money printing have’t triggered any real economic or trade growth. We can even see that the viability of innovating, of creating new products, of selling products for a profit has become secondary to the goal of just having a corporate presence on the public investment markets. Today, it’s more important for company managers to list their company on the stock exchange than it is to actually create an innovative product that makes money. So we have an economic system that incentivizes reckless debt behaviour, which leads to asset bubbles, boom-bust cycles, massive debt, mal-investment and inflation. But how has this monster of debt and inflation been created? What’s at the core of our current economic system? It’s the monetary system that allows government to steal through taxation and inflation. Taxation is of course the same as theft. They just had to invent another world of it. Income tax of 30% sounds a hell of a lot better than income theft of 30%. Everyone agrees that it would be wrong for me to go up to someone in this room with $100 and steal $30. Just because a group of people get together and call themselves the government, it doesn’t change the immorality in stealing. The monetary system, of course, also redistributes wealth via inflation. Inflation is also theft but in a discreet way as it happens slowly without the general population being aware of it. What did a gallon of milk cost when you were young? What did an ice cream cost? Inflation is a redistribution of wealth from late receivers of newly printed money i.e. you and I, normal people, to the early receivers. i.e. the government, the central banks and the commercial banks. The US Dollar is important in this context because the US Dollar is the reserve currency of the world. As we can see from this chart, the US Dollar actually did pretty well until the beginning of the 20th century. But what happened in the beginning of the 20th century? The Federal Reserve was created in 1913 and the world went off the gold standard. Since then the world’s currencies have lost 99% or more of their value. We have been indoctrinated into believing that the world’s current monetary system is a natural system, but nothing is further from the truth. We should have moved on from it a long time ago as this monetary system really is the root cause of the financial debt disease that we are seeing today. Today more and more people are becoming aware of the Federal Reserve’s counterfeiting of money through Quantitative Easing (QE). However, it’s still a mystery to many how most of our money is created today. Most of today’s money is created not by central banks, but by normal commercial banks. It’s just created out of thin air when the commercial bank extends a loan. There’s nothing backing this money creation, there’s nothing tangible to it. Let’s illustrate how it works with an example. We have Robert who is in the market for a 1 million dollar house. Robert’s career choice is as a fast food restaurant worker, part-time, on minimum wage. But Robert knows he has to look credit worthy when meeting his bankster so he dusts off his tie for the occasion. The bankster takes a quick look at Robert and judges him as credible. No problem. You’ll get the mortgage. Now, where did the USD 1 million that the bank lent Robert come from? 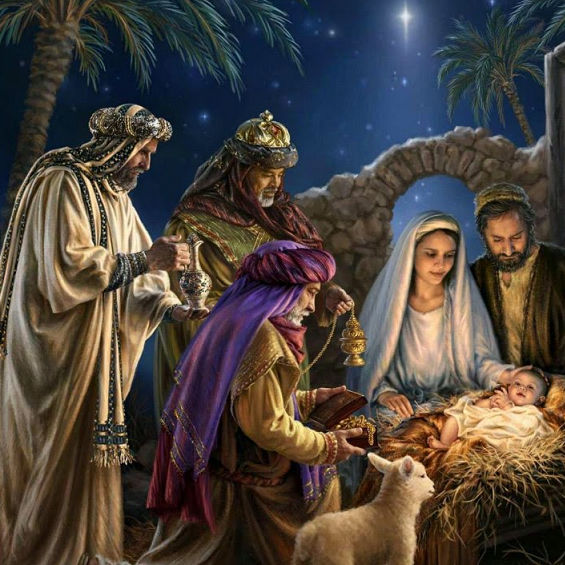 It was created out of thin air when the bank extended the loan to Robert. It was just created as a book-keeping entry in the bank’s accounting system out of thin air. This is how approximately 92% of US money supply is created today. It’s created by banks out of thin air when lending. It’s easy to understand, but for some people hard to believe as it’s just too absurd. Only 8% of the US Dollar money supply today exists in physical form and even this 8% are just worthless pieces of paper that only have a value as long as people can be brainwashed into believing they have a value. Some people actually still think that the US Dollar is gold backed. As a thought experiment, let’s calculate what the price of gold would have to be for the US Dollar to be backed by gold. The Federal Reserve claims to hold, and note that I say claims to hold because there has never been any independent proper audit of the US Treasury vault holdings, 8133 metric tons of gold. At the same time there’s about 17 trillion of US Dollars in circulation. The price of gold is currently about USD 1300 per troy ounce. The US gold reserves as valued in US Dollars would therefore be worth about 340 billion dollars. This means that the price of gold would have to rise 50-fold for all outstanding US Dollars to be backed by gold today. 50-fold. This is how much the value of our currencies have been eroded. We can thus see that the world’s current money system isn’t serving us the people. But what is money in the true sense? For something to emerge as money on a free market, it needs to serve three purposes. Medium of Exchange – Money is the intermediary in the exchange of goods and services. If we don’t have money, we’re back to barter systems of medieval times which is very impractical. 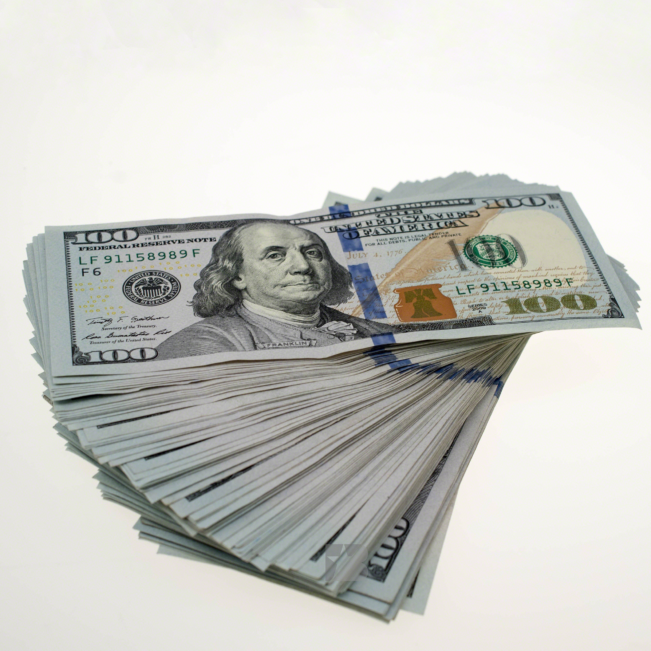 Unit of Account – Money is supposed to serve as a measuring stick that everyone understands. Money is a frame of reference. And sure, if I tell you that something costs $100 you have a pretty good idea how much that is, but the problem is that it takes $100 today to buy something that cost $1 a hundred years ago. Store of Value – Money is supposed to keep its purchasing power over time, to keep its value. Let’s now compare paper currency and gold to see which has the best monetary characteristics. Durability – Money is not supposed to corrode, oxidize or burn. Well, paper money burns easily whereas gold melts under heat but isn’t destroyed. Portability: Paper money and gold can both be moved. Electronic currency can be moved very easily but can also be deleted by the stroke of a key. Divisibility – Let’s do an experiment. I have here a 10 dollar note and a 1 gram gold bar. Now what happens if a split this 10 dollar note, what does it become? Does it become two 5 dollar notes? No it doesn’t, it becomes two worthless pieces of paper. Now what if I instead split this 1 gram gold bar into two equally sized pieces, what does it become? It becomes 2 bars of 0.5 grams each which together is still what I had at the beginning i.e. 1 gram! This tells us a lot about the worthlessness of our paper money. Intrinsic Value – Gold has a high value because of its metallic characteristics. It has high density, it’s soft but still strong, and it’s what’s called malleable, meaning that it can be stretched without breaking. 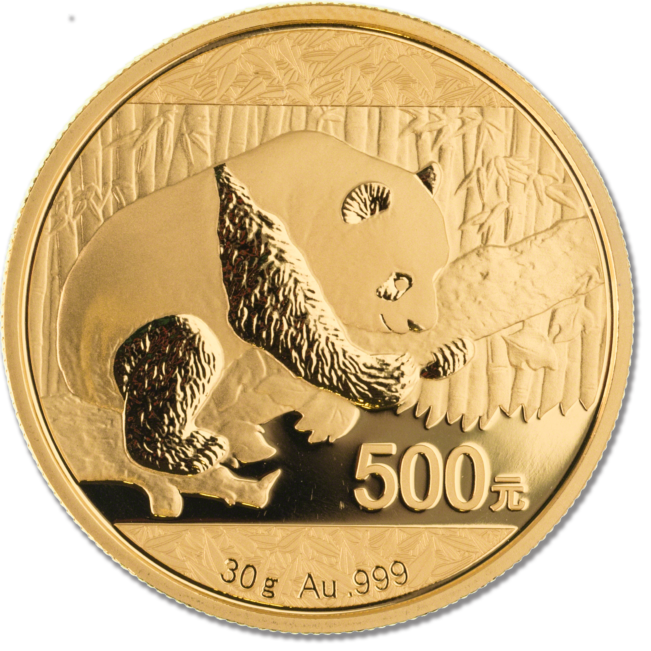 A 1 oz gold coin can actually be stretched out 50 miles without breaking. That’s 6 times all the way up and down the Las Vegas strip! By using dishonest money as the world is doing today, we get huge global imbalances. The US is running a massive trade deficit. There’s much more stuff coming into the US than there is leaving. How are the excess imports paid for? The answer is that it’s paid for by newly created money. It’s interesting to note that it’s only possible to run trade deficits to this enormous extent if you issue the currency that is used as reserve currency. This is thus only possible in the US, as the US Dollar is used as the world’s reserve currency. In any other, non-US country, it wouldn’t have been possible because the currency would depreciate when there’s a continuous trade deficit. When the currency is depreciating, it becomes more expensive to import goods and it becomes cheaper for others to buy exported goods. Trade is therefore rebalancing. This is not happening in the US though and the reason for it is that the US Dollar itself is demanded as reserve currency around the world. There’s a lot of finger-pointing towards the US because of this, blaming the US for living beyond its means. I don’t agree with that though as it is the rest of the world, i.e. non-US countries, that is demanding US Dollar as reserves which they don’t necessarily have to do. So this is what’s called an exorbitant privilege. Things are changing rapidly though as structural changes to the system are long overdue. The system we have today is in no way sustainable. The US Dollar is losing structural support from surplus countries, most notably from China. Foreign countries are no longer increasing their reserves of US Dollars. China is no longer increasing its holdings of US Treasuries. They stopped buying them. So the system of the US Dollar acting as a reserve currency is very fragile and is only holding together based on the premise of more bribes. Private investors, especially in countries where the markets and currencies are failing such as in South America, buy bonds but they only do so on the promise of more and more easy money to come. People have been conditioned for many decades to run to the US Dollar as a safe haven although I predict that to soon change. Foreign governments and particularly China are not interested in owning anymore US debt though. The question is when will the private support for the US Dollar stop, because then there’s no one to support US debt anymore except the Fed itself. When will it happen? Timing wise I’m not sure. When I started Liberty Silver in 2008, I thought it would happen much sooner that it has. Sooner or later, it’s going to happen though. We will first get a strong deflationary pressure, we are basically in that phase already. Credit will default but this will not be accepted by the governments, who will buy up debt at all costs, eventually leading to a crisis of confidence and then we’re in big trouble because then people will start to spend their savings quickly leading to hyperinflation. And when that happens, debt and credit is not a good store of value. And who best understands this situation today? China still has a big surplus though so what do they buy instead? They are buying tangible assets. Gold is one such asset but China is also a major foreign direct investor in all sorts of projects from mining in Africa to infrastructure in central Asia. The Chinese understand that the days of the US Dollar are numbered. Whereas Westerners have mostly been shunning gold for the latter part of this decade, the Chinese have been vacuuming the world’s vaults for physical gold. 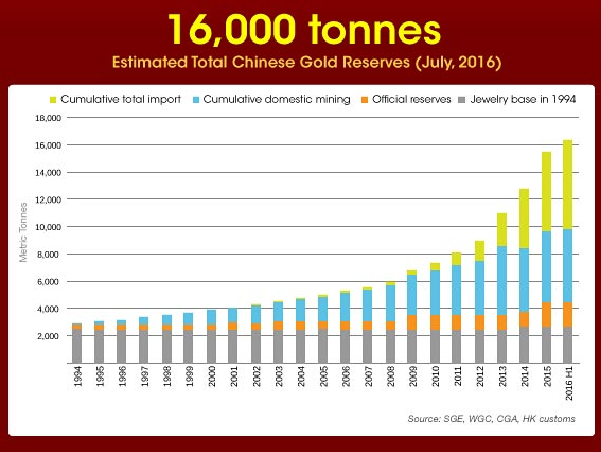 This chart shows that the Chinese, including both the government and private sector, are holding at least 16,000 tonnes of gold. The Chinese government even runs adverts on national TV encouraging everyone to buy gold. Just imagine the US government running adverts on national TV encouraging people to buy gold. Why do the Chinese do this? The simple answer is that they understand that gold is a stable savings asset, but they also understand that the days of the US Dollar as the reserve currency of the world are numbered, and they understand that gold is a much better safeguard against inflation and currency destruction than anything else. This trend of gold flowing from the West to the East is the same as a flow of power from the West to the East. 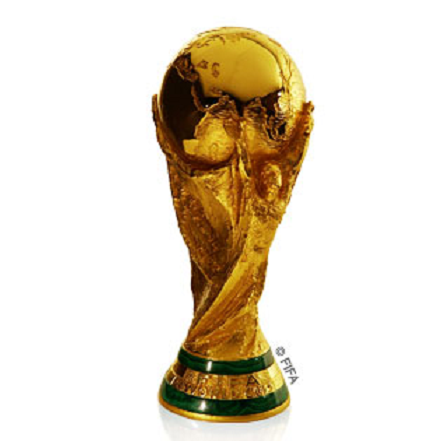 It has huge geopolitical implications because whoever has the gold in the end has the power. 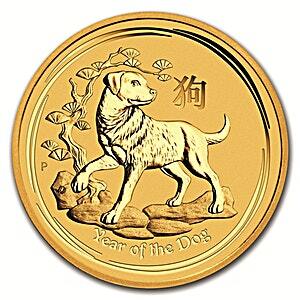 In my opinion, the Chinese are buying as much gold as they possibly can without breaking the neck of the market. I’m in a fortunate position because I’m running 3 bullion dealers across the world, both in the west and in the east. I have two businesses in Europe and one in Singapore in Asia so I’m fortunate to be able to compare eastern and western gold mentality. What I see is that when the price of gold is going up, westerners buy. In the west, most people are looking to get a return on their investment. That’s how we’ve been conditioned because if we don’t get a return, inflation will eat up the value of the money. But when the price of gold is dropping, there are a lot of Asians buying. We get queues outside our shop. Easterners are not looking for a return on their investment. What I see is that easterners don’t view gold as an investment vehicle. They view gold as real wealth, they view it as a safeguard against inflation and currency destruction. They view it as savings which provides independence. In the west, we see the opposite. When the gold price is dropping, Westerners give up. It’s not good for my investments so I need to chase some other investment. So in the West, people instead buy when the price goes up, due to being trend seekers, as we’ve also witnessed this year. But in my opinion, we can learn a lot from the Eastern mentality because the Eastern mentality is that gold is savings. There’s no counterparty risk for gold. You don’t have to trust any government, central bank or commercial bank when you buy and hold gold. You don’t need to trust anyone because you hold your wealth yourself so you’re in control. Simply put, in the East, people are value buyers and buy for generational wealth, whereas in the West people mostly buy gold for the lure of currency profits. 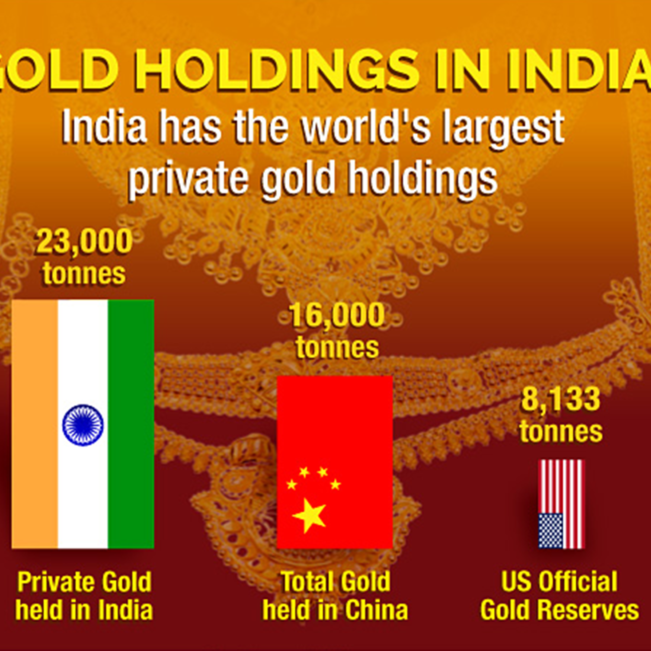 How can Westerners piggyback this successful strategy to save/invest in gold outside the reach of intrusive governments? Let’s take a look at Singapore. I’ve been living in Singapore for about 3 years. I relocated with my family 3 years ago from Sweden, the worst socialist country in the world. And the country with the most political correctness by far anywhere. You think it’s bad in the US, check out Sweden. Socialism is cancer. I’m not going back there. I moved to Singapore simply because it’s the best country in the world for precious metals, it’s as easy as that. Whether my kids agree, I don’t know but they like to play with silver coins and actually understand the intrinsic value of precious metals much better than most people in their 40’s and 50’s. Singapore is the new Switzerland for asset protection. It’s the best and safest country in the world for wealth preservation. Singapore is unique. 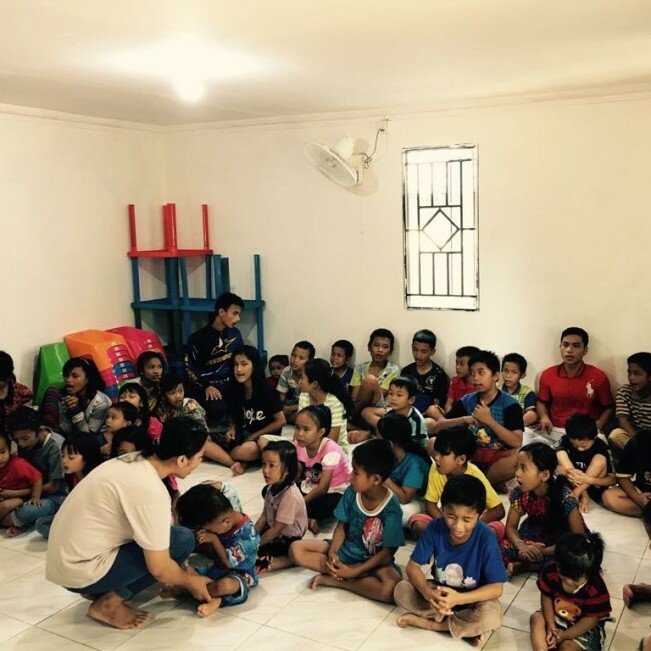 Let me tell you my story about when I first went to Singapore. 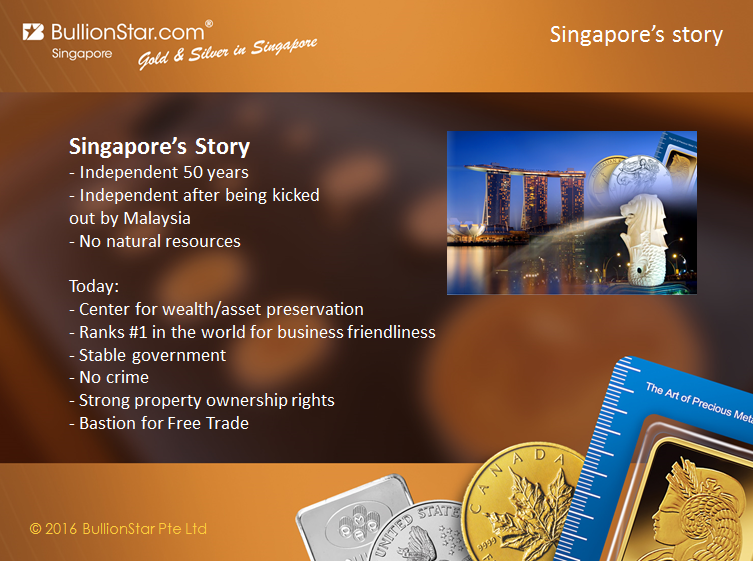 My business partner and I first visited Singapore on an exploratory trip researching whether to establish BullionStar in Singapore after we discovered that the Singaporean government was abolishing the sales tax on precious metals in Singapore in 2012. This is interesting because how many countries today are deregulating anything let alone precious metals? In other countries the rulebook just gets bigger and bigger. I know there’s many absurd examples from the US. From Sweden where I originate, the guidance on the sales tax that all companies must know and follow is 3,000 pages long. That’s insane. The rulebook of absurdity is just growing. Singapore may be the only country that is taking the opposite route of actually removing rules. In Singapore, the government wants to create a trading, transit and storage hub for precious metals so they actually removed the major hindrance to that, the sales tax (GST / VAT as it’s called in some countries), which is rather unique. So on my first trip to Singapore together with my business partner, we went to one of the suppliers in Singapore to discuss business opportunities. We had a general business discussion and they said, have you talked to the government yet? So I’m from Sweden where if you send a question to a government authority, in best chance you may get a reply after a few months if you’re lucky and they’ll most likely harass you with an inspection or audit while they’re at it. We’ve been through a lot of that in Sweden even though we’re following all the rules meticulously. The Singapore supplier told us that we can indeed contact the governmental trade agency in Singapore so I said why not and I sent the government contact person an e-mail 11 pm. I get a reply in three minutes saying that we’re welcome to meet them the next morning at their office. Baffled, I replied that we will show up so we rock up to their office at 9 am in the morning. There are two guys meeting us. They are in their 20’s – 30’s and we discuss business opportunities with them. They tell us that we are welcome in Singapore, and that they want us here, and they encourage us to get started, and facilitate the introductions to different stakeholders and suppliers. We were quite amazed and we went for it and established BullionStar in Singapore four years ago. So in general terms, the Singaporean government is keen to incentivize productivity and they understand that the private economy is the backbone of the economy. Singapore was actually literally kicked out of the Malaysian Federation 51 years ago. With nothing going for them and with no natural resources, the journey since has been a tremendous one. In a mere 50 years, which isn’t a very long time when it comes to building a country, they’ve established the premier financial center of the world. They have done this with a very strong rule of law where there’s a lot of freedom within a set framework. 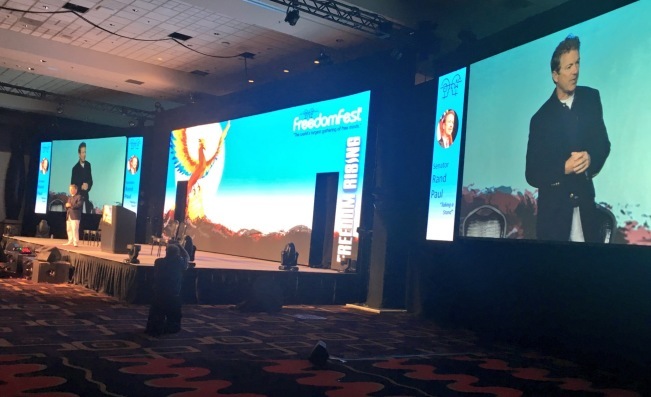 You have a lot of freedom as long as you keep within that framework and you especially have good business freedom. Now, if you bring in guns or drugs, you’ll be put away for a long time if not forever. I’m a libertarian so I don’t really agree ideologically but I can see how this has been serving Singapore very well as a city-state, as there’s no shootings whatsoever and very little drugs. Singapore is the most business friendly country in the world. Hands down. The Singaporean government runs Singapore like it was a company. They focus on productivity and innovation and luckily they are a too important as a country to be listed on any grey or black list because of their low tax regime and financial protection. They are also very good diplomats. A few years ago, OECD put pressure on Singapore to start signing Tax Information Exchange Agreements. The Singaporean government said, yes we will start signing these agreements. To date more than five years later, they have signed one such agreement with…Berumda…Strengthening Singaporean-Bermudian ties to ensure that the OECD doesn’t bother them. Compare this to Sweden is day and night. Sweden is often perceived as some sort of mellow well-working ideal. Bernie Sanders is touting Scandinavia as some sort of socialistic dream. Let me tell you, he’s got no clue what he’s talking about. Sweden’s been going downhill severely in the last decades. Crime is rampant. Due to the migration crisis, Sweden tops all countries for sexual violence. In 2015 alone, 163,000 asylum seekers predominantly from Syria and Afghanistan, arriving into a country with a population of only 9 million. Everything is totally breaking down. You could never run a storefront precious metals dealership in Sweden like we do in Singapore. Sweden is also practically cashless. 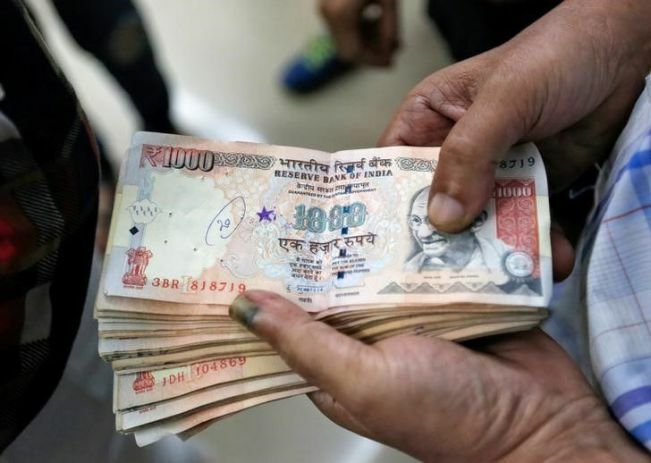 Cash is rare as a payment mechanism, and oftentimes no longer accepted. I was very concerned about my family while we still lived in Sweden even though my Swedish bullion dealer business, Liberty Silver, didn’t have a physical shop but just sent parcel deliveries via insured registered mail. In Singapore, you can see currency exchangers exchanging tens of thousands of dollars without any security glass or any protection whatsoever and it’s completely normal. A couple of months after I moved to Singapore, I walked past Raffles Place, in the Central Business District, and there was a currency exchanger in the process of counting cash in a counter, standing outside his booth with a currency counting machine. Just when I walked past, there was a gust of wind and a pile of bills were taken by the wind and this was on the busiest street of Singapore with lots of people walking by. The exchanger calmly walked around and picked up the 100 dollar notes like nothing had happened. I had to veer to the side not to step on any of them. What does that tell you about the security in Singapore? It’s incredibly secure. No one would dream of doing anything. It’s a combination of no social exclusion and harsh penalties. There’s no unemployment whatsoever in Singapore. Every shop you walk into has a sign: “we are hiring”. There’s a shortage of labor. Social standards are thus good. At the same time, the punishments for violent crimes are extremely harsh and includes caning. Michael Fay, a US citizen, was actually sentenced to six strokes of the cane in 1993 after vandalising cars. The US protested loudly that caning was excessive for a teenager who committed a non-violent crime. The US embassy pointed out that the damage to the cars he vandalised wasn’t permanent but the scars from the caning would leave permanent scars on the US citizen. Bill Clinton pressured Singapore to grand Mr. Fay clemency but Singapore stood its ground and carried out the sentence although reduced to four strokes. It’s a rather harsh punishment. Your buttocks are bared and after three stokes, deep cuts are usually opening with blood squirting out. The enforcer must use the full force of his arm. So this is an example of the rule of law in Singapore and whether you like it or not, it seems to serve as a deterrent. Singapore is the very best country in the world for buying and storing precious metals. There are no taxes on bullion whatsoever in Singapore. The Singaporean government has actually deregulated the precious metals market. There is no sales tax, no capital gains tax, no import or export taxes, no tariffs or restrictions, no inheritance tax, no gift tax, no dividend tax. Before 2012, there used to be GST (sales tax) on physical bullion, but as I mentioned they abolished that tax in 2012 as they want to encourage bullion dealers to establish in the country. As we all know, Western countries introduce numerous invasive laws targeting privacy and that place the right to buy and store bullion confidentially under attack. Importantly, there are no reporting requirements, whether domestically or internationally, when someone buys or stores precious metals in Singapore. Your bullion is your private business and we are under no obligation to report your holdings to anyone. If you buy and store bullion with us, we don’t report it to anyone. You can hold bullion completely confidentially in Singapore and that also applies to FATCA. There’s no FATCA reporting for BullionStar because we are not defined as a financial institution. We are keen on helping you defend your right to buy and store bullion confidentially without your local authorities prying into your bullion ownership. The Singaporean government has chosen precious metals as a growth industry. Singapore is keen on creating a trade, transit and storage hub for precious metals in Singapore. As regards safety, you can confidently walk into our storefront bullion retail store in central Singapore and buy bullion with cash, then hand carry your bullion out without being hassled due to the zero crime rate. This has the advantage that the insurance cost for bullion in Singapore is low. By the way, the sentence for robbery in Singapore is up to 20 years in prison and a minimum of six strokes of the cane. In Singapore, property ownership rights are also very strong. Singapore doesn’t allow frivolous litigation. Remember that it’s less than 100 years since the US outlawed gold ownership. Western governments have a long history of stealing. It seems they can’t help themselves when it comes to stealing. Singapore has no history of any confiscations, seizures or anything like that. So, storing bullion in Singapore is an insurance policy against government intervention, wealth confiscation and frivolous litigation. What makes BullionStar unique is that we combine online usability with physical accessibility. BullionStar.com is our website where you can buy, sell and store physically allocated and segregated bullion. It’s very easy to get started with us. Other bullion dealers also say that it’s easy but then they nonetheless slap you with 7 steps and require you to send in documentation. Signing up for an account with us is a one page registration form. It takes less than a minute. Much easier than signing up for a Gmail account or booking a flight online. There are no documentation requirements. We don’t force you to send us any documentation at all. You input an e-mail address, password, your address and select a PIN number. It takes, if you’re quick on the keyboard, 30 seconds, and placing an order takes another 20 seconds. You select the items to buy, you go to the checkout and submit your order. One page checkout. I think I speak for many of us in how unnecessarily complicated everyone makes their online interfaces. PayPal, booking a flight ticket, government agencies, banks. They try to trick you into different things you don’t want. Add insurance, add car rental etc. It should be easy to buy and store gold. A lot of customers are genuinely surprised about how easy we make it. We get good feedback on how easy it is to deal and transact with us, and we have over 600 genuine Google reviews with an average of 4.8. You can handle everything online 24/7. You can buy, sell, store, order physical withdrawal of your metals online and even audit your metals online. 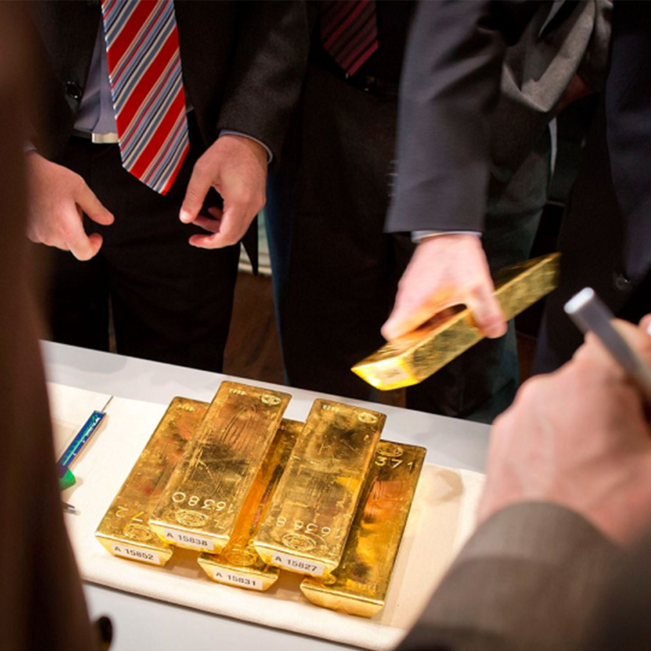 Trust is very important in the bullion industry. If you trust as with your hard-earned savings, you have to be able to trust us. What I tell our customers is, don’t trust us. Do your own due diligence. Don’t take my word for it. Read up on us. Google us and do your own due diligence. If you choose to buy and store bullion with us, it’s important to know that we have five different auditing methods. We employ the LBMA-approved auditor Bureau Veritas to do third-party audits on all customer holdings bi-annually. We have something called the Live Audit Report where everyone can anonymously check on their own and all other customers’ bullion holdings. Furthermore, we allow and encourage customers to walk-in to our bullion center in Singapore and do their own auditing of their own metal. If you choose to go to Singapore to audit your metals, you don’t even have to notify us beforehand. You can just show up and ask to audit your metals, and we facilitate this on the spot. We will bring out your metals from the vault to the meeting room. You can go through everything and compare your bars and coins against your records and have a look at your own metals. This auditing program it thus very comprehensive. We also take photos of your bullion and upload these images to your account. As soon as you have settled your payment, we process the metals into vault storage and take pictures of the actual bullion so that you can compare the bar serial numbers with your invoice. If you then come to our bullion center to do a physical audit yourself, you can again check on the serial bar numbers and if you physically withdraw your bars, those are the exact bars you receive. With us, you own specific products. Your bars are allocated with you holding the direct legal title to the physical metal. You can of course have your products shipped to you at any time fully insured. Even though Singapore is the safest country in the world, we have full insurance protection with the largest specie underwriter in the world, Chubb Insurance, for all risks at full replacement value. You can download the insurance document online. What’s good is that as there’s virtually no crime in Singapore, it makes the storage premiums low. 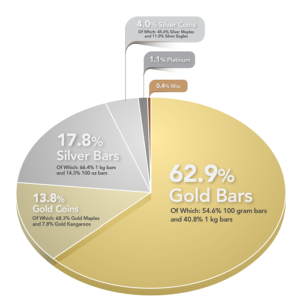 We charge 0.39% of the average value per annum for gold and 0.59% for silver which includes full insurance for all risks, and all handling and online access for your segregated and allocated gold, which is very competitive. Just like you can physically audit your metals, you can also come in to our shop to physically withdraw your metals without any prior notification. You show up, present your ID and tell us that you want the metals now and we simply hand over the metals to you. We can do this as our vault is actually integrated into the same venue as our shop. Our bullion center consists of a retail bullion shop, showroom and vault in one and the same venue truly making it a one-stop-shop for everything precious metals. Our shop used to be a bank branch and has an old style bank vault built into it. The vault was built several decades ago and I believe the reason why the vault is still there is because of its sheer impenetrability. It’s 30 inches thick, constructed from concrete and full of steel bars in the walls. This is a unique shop. Nowhere else in the world do you have the flexibility of buying, selling, storing, depositing, valuing, physically auditing and physically withdrawing metals in one and the same storefront place without any prior notification. You can just walk in, we have 20 showcase displays full of precious metals. So unlike many other dealers, we don’t hide online on the internet and we believe this combination is quite unique. Singapore is a long way from the US and you don’t need to visit us to buy and store bullion with us. You can handle everything online. But if you ever go to Asia, I highly recommend that you pay us a visit to have a look. Whether you’re a customer or not as it’s a pretty cool concept. Another unique feature that we offer is our BullionStar account. 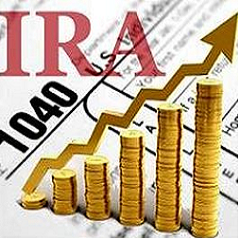 If you’re considering opening an offshore account, we have the ideal solution for that. 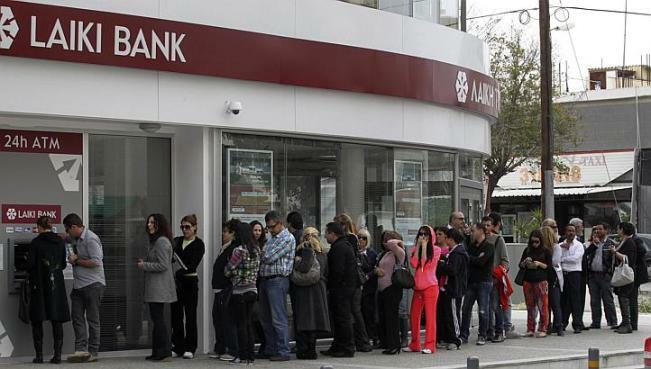 It’s becoming more and more difficult to open bank accounts abroad. This is true generally but especially true for US customers. 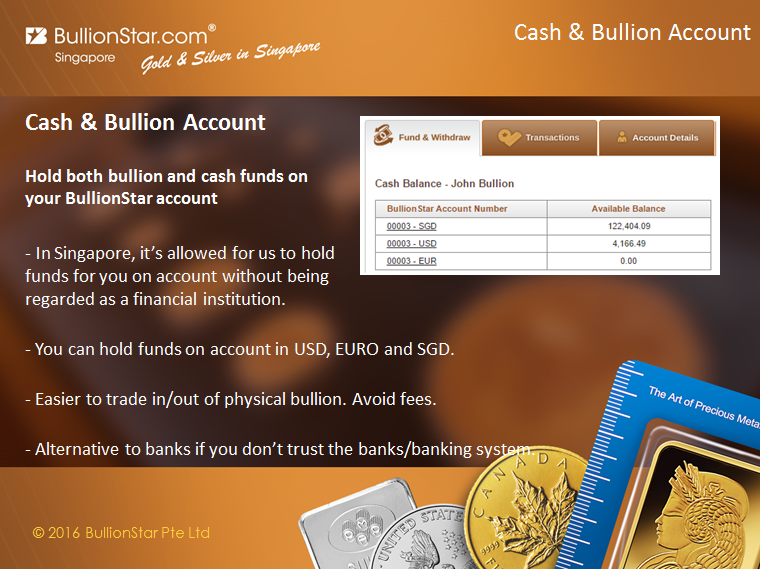 With a BullionStar account, you can hold not only bullion on your account but also cash. You can hold US Dollars, Euros and Singapore Dollars on the account. It works like a bank account but we are not a bank. 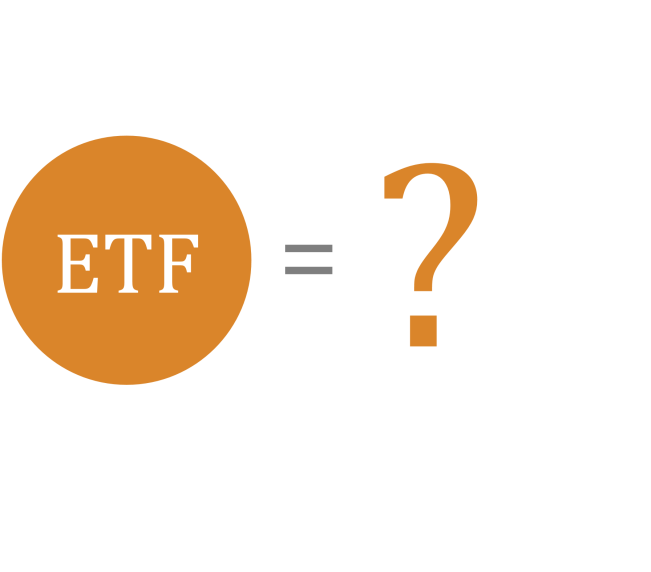 This is what is called a stored value facility and is under the same regulations as e.g. how PayPal holds client money. As we don’t operate under the risky fractionally reserved banking system, this is much safer than a bank account. It makes it very easy to trade physical bullion, and makes it easy to average in or out of positions. Funds can be held indefinitely on the account and can be used towards purchasing bullion at any time or you can withdraw your funds at any time. 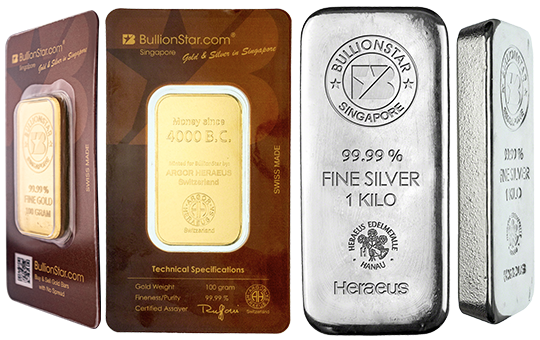 BullionStar Gold & Silver Bars are the world’s first and only gold & silver bar traded without any spread without the buy and sell price. This means that at any given point in time, the buy price is the same as the sell price. What’s the hook you might ask. Well, the initial price premium is slightly higher compared to the spot price of the metal than for other bars of comparable price, but instead there is no spread so you don’t have trading cost whatsoever thereafter. The bars are also very aesthetically attractive and if you haven’t been yet, come by our booth 425 to check them out. The BullionStar gold bar is produced by the Swiss refiner Argor-Heraeus and there’s an inscription on the back side of the bar stating “Money since 4,000 B.C.” matching our ideological belief that gold is money. The BullionStar silver bar is produced by the renowned German refiner Heraeus. These bars have become tremendously popular as they eliminate the often large spreads faced by physical silver investors. BullionStar was set up for the purpose of international diversification, and to provide confidential offshore bullion storage while being very accessible and transparent for the customer him/herself. Even though we have a lot of local Singaporean customers given our local shop, it was, to a large degree, set up to cater to offshore bullion protection specifically. 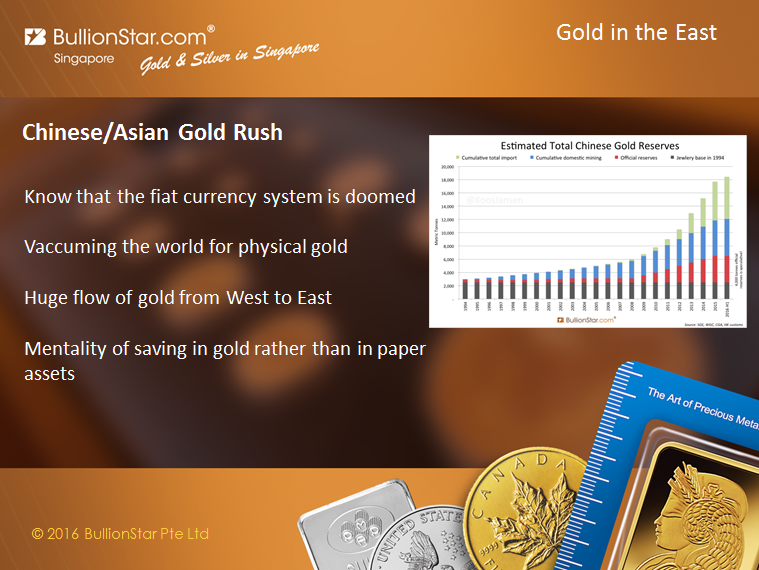 There are no taxes on bullion in Singapore and there are no reporting requirements whether locally or internationally. We treat your holdings with full confidentiality although we are very transparent to our customers. 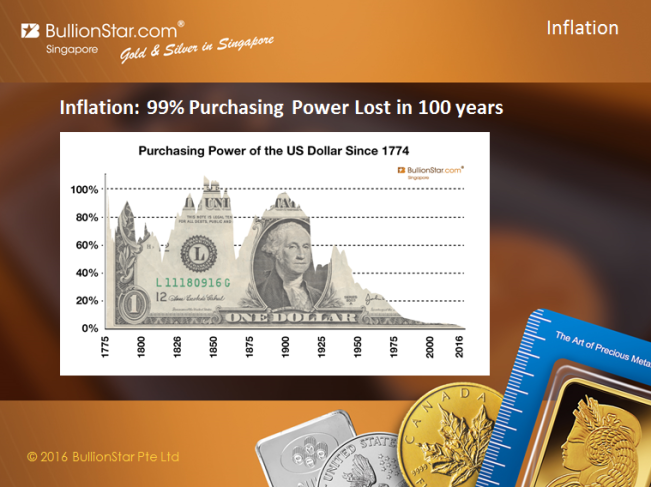 BullionStar is unique in that we combine online usability with ease of registration and ease of online trading coupled with the accessibility of a physical bullion shop and vault in central Singapore. It’s a one-minute process to sign up and place your first order with us. With your BullionStar account, you can hold both bullion and cash funds in US Dollars, Euros and Singapore dollars on the same account, which is very convenient as it takes out the banks as the middle man between you and us. When you hold metal with us, it’s your metal – fully allocated and segregated. We deal with physical metals only. With us, you specifically choose which items you buy. You place an order on e.g. a 1 oz PAMP gold bar. 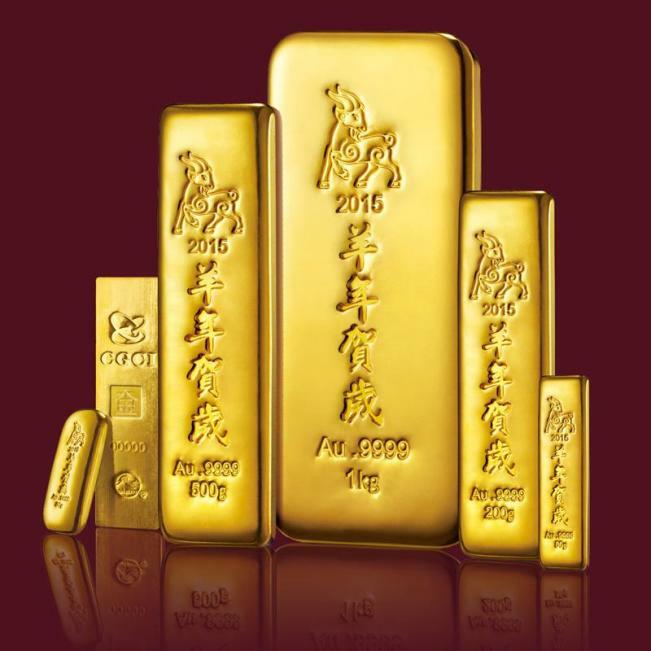 We upload pictures of the specific gold bar that you own to your account. We input the serial bar numbers on your invoice. 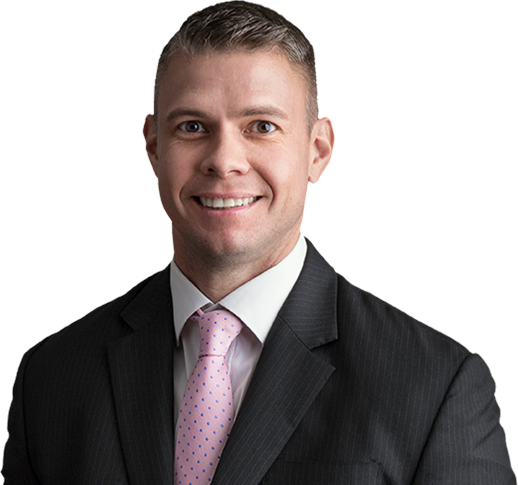 We store that specific bar for you specifically and you have the legal title to that gold bar. You can then follow your holdings online in real-time and when you prefer, you can sell or physically withdraw (or audit) your 1 oz gold bar. When you audit or withdraw your gold bar, you are given the exact same gold bar with the exact same serial number as you were allocated when you bought it. By introducing the BullionStar Gold & Silver Bars which can be traded without a spread between the buy and sell price, we’ve solved the problem of large premiums that physical bullion investors and savers were facing. And we have the most competitive storage fees in the industry. But don’t take my word for it, check us out online and while Singapore is a long way from here, if you’re ever around in Southeast Asia, come and visit us at 45 New Bridge Road in Singapore. Our booth number is 425 where we have some awesome metal on display and also a very cool video game, the QE defender, where the objective is to obstruct the Fed, ECB and Bank of Japan from dropping money into banks.